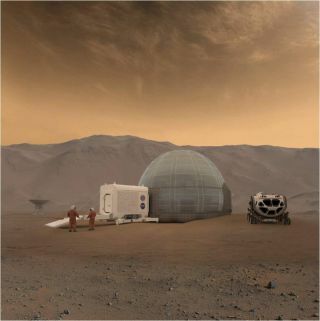 Artist's illustration showing crewmembers arriving at their pre-deployed Mars Ice Home. The presence of accessible ice on the Red Planet warms the heart of a collaborative group at the NASA Langley Engineering Design Studio in Hampton, Virginia — an expert team that is chipping away at designing a "Mars Ice Home." The notional Mars Ice Home's first-floor layout. The Ice Home in the Martian evening. The second-floor layout of the notional Mars Ice Home.